We've all dreamt about it at one point or another, but now it's time to really start living it up in lavish luxury. Click here to play! Take yourself down to this slot and start enjoying the finer things in life. 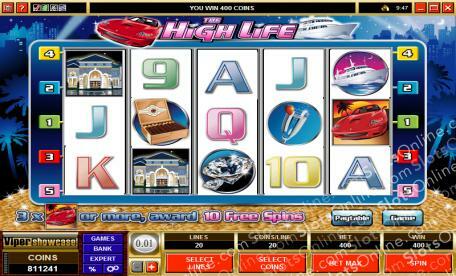 The High Life is an entertaining 5-reel slot that is played across five intriguing pay lines. The Racing Car is Scattered and will earn you up to 100 times your initial bet as well as paying out on any pay line. If you manage to spin up three or more Racing Cars you will also win yourself 10 free spins. The Mansion is Wild and only appears on reels 2 and 4; it can be substituted for any other symbol on the reels except Scattered Cars. For excessive payouts, it is best to play for the Luxury Liner symbol, as it will pay out massive winnings when three or more appear, up to 1500:1 when five show up on active pay lines. The High Life is just around the corner, so start playing and winning today! The Racing Car is Scattered and can appear on any pay line to be paid out. If you manage all five in one spin you will win yourself 100 times your bet. Three or more will also earn you 10 free spins! The Mansion is Wild, appearing on reels 2 and 4, and can be substituted for any other symbol on the reels except Scatters.